Police shot and killed a sword-wielding man described by relatives as schizophrenic after he slashed and killed two former co-workers and wounded three other people at a supermarket where he used to bag groceries. The attack touched off a panic as shoppers fled the crowded store shortly after 9:30 a.m. Sunday as police went in to subdue Joseph Hunter Parker, who was armed with a samurai-style sword and wearing a beret and trench coat, said police Cmdr. Jeff Noble. The Los Angeles Times reported that Parker calmly attacked his victims in silence, almost beheading one of them. Employees armed with barbecue utensils and trashcan lids tried to corner him, the newspaper said. "There were trails of blood everywhere. People were running. A lady was screaming," customer Javier Ascencio told the Times. "I was yelling for everyone to get out. Things just happened so fast." The 30-year-old man confronted an officer before fellow officers shot him, said Lt. Jeff Love. Parker was taken to the hospital and did not survive. One of the wounded was an Albertsons employee and two others were customers, police said. Police did not release the names of the dead or wounded. "It was mass hysteria," Terry Fowler, a nurse who helped staff an impromptu triage center outside the store, told the Times. "Everybody was in shock." 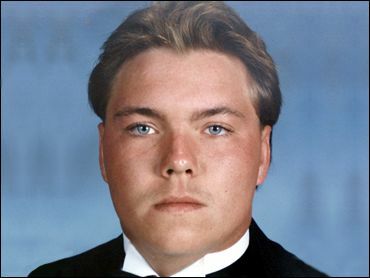 Parker had been diagnosed as schizophrenic, his mother, Susan Davis, said in an interview Sunday from rural Ford, Va. He also was a volunteer firefighter and emergency medical technician. "He was not in a good state at all," Davis said, adding she had not spoken to Parker in about a year. "He said voices were telling him to do bad things." Davis said Parker, who moved to California about five years ago, collected swords and was a fan of the "Highlander" film and television series in which the hero is a swordsman. "I'm just sorry about what happened," Davis said. Parker's former co-workers said he quit his job bagging groceries about two weeks ago after working at Albertsons for about two years. "I never felt threatened, but he was just a really odd man," said co-worker Mark Ming, 26. "He would have full conversations with himself. He obviously had problems, but he was respectful toward customers." Parker's sister, Heather Parker, 28, of Anaheim, said she hasn't spoken to her brother in several months. "He was alone and he was very mistreated his whole life," she said in a telephone interview. "He was being treated for schizophrenia. He's never been in trouble. He didn't drink, didn't use drugs. He was kind." Love called the attacks an aberration in the quiet city 40 miles southeast of Los Angeles, which he said averages less than one murder a year. About 143,000 people live here.